Click SigmaXL > Templates & Calculators > Basic MSA Templates > Gage R&R Study (MSA) to access the Gage R&R Study template. The following example is given in the file Template & Calculator Examples.xls. Click on the worksheet named Gage R&R. If prompted, please ensure that macros are enabled. The Automotive Industry Action Group (AIAG) recommended study includes 10 Parts, 3 Operators and 3 Replicates. The template calculations will work with a minimum of 2 Operators, 2 Parts and 2 Replicates. The data should be balanced with each operator measuring the same number of parts and the same number of replicates. Use SigmaXL > Measurement Systems Analysis to specify up to 30 Parts, 10 Operators and 10 Replicates. Enter process Upper Specification Limit (USL) and Lower Specification Limit (LSL) in the Process Tolerance window. This is used to determine the % Tolerance metrics. If the specification is single-sided, leave both entries blank. The default StDev multiplier is 6. Change this to 5.15 if AIAG convention is being used. The cells shaded in light blue highlight the critical metrics Gage R&R % Total Variation (also known as %R&R) and %Tolerance: < 10% indicates a good measurement system; > 30% indicates an unacceptable measurement system. The Gage R&R Multi-Vari and X-bar & R charts can only be generated if a Gage R&R template has been completed and is the active worksheet. Select the Gage R&R worksheet and click SigmaXL > Templates & Calculators > Gage R&R: Multi-Vari & X-Bar R Charts to create the above charts. The Multi-Vari chart shows each Part as a separate graph. Each Operator’s response readings are denoted as a vertical line with the top tick corresponding to the Maximum value, bottom tick is the Minimum, and the middle tick is the Mean. The horizontal line across each graph is the overall average for each part. When interpreting the X-bar and R chart for a Gage R&R study, it is desirable that the X-bar chart be out-of-control, and the Range chart be in-control. The control limits are derived from within Operator repeatability. Click SigmaXL > Templates & Calculators > Basic MSA Templates > Attribute MSA to access the Attribute MSA Study template. 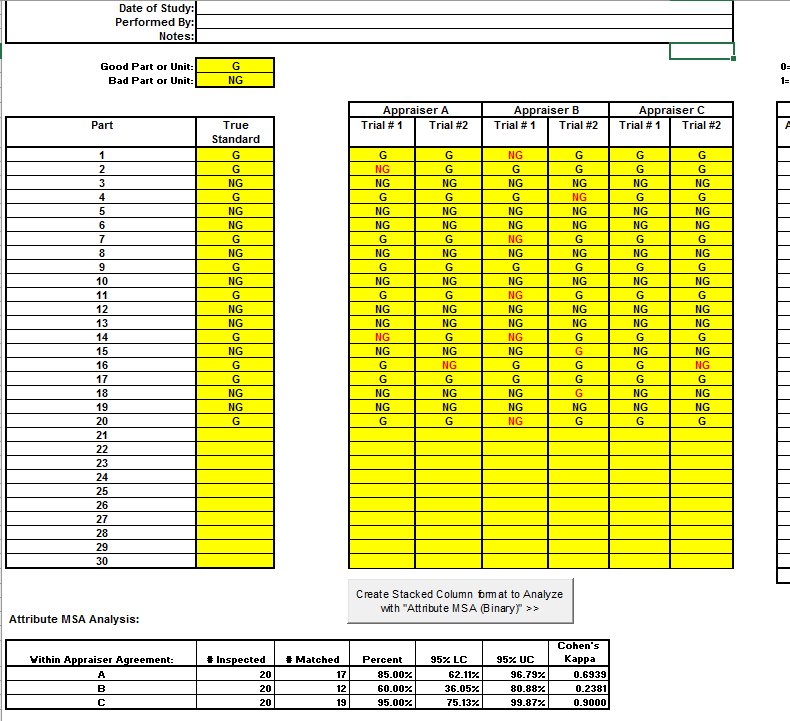 Click on the worksheet named Attribute MSA. Attribute Gage R&R is also known as Attribute Agreement Analysis. Recommend for study: 3 Appraisers, 2 to 3 Replicates, Minimum of 10 Good Parts and 10 Bad Parts. The data should be balanced with each appraiser evaluating the same number of parts and the same number of replicates. Specify the Good Part or Unit as G or other appropriate text (P, Y, etc.). Specify the Bad Part or Unit as NG or other appropriate text (F, N, etc.). Be careful to avoid typing or spelling errors when entering the results. A space accidentally inserted after a character will be treated as a different value leading to incorrect results.